Design an attractive landscape and adorn your home with a beautiful natural view right outside your property. The landscape is an outdoor area where you, your family and friends can gather, relax and enjoy. A landscape simply transforms your outdoor space into a beautiful and practical arena. We understand your craving for a well-planned and meticulously built outdoor space. Complete Home Improvement provides turnkey solutions for creating unique residential gardens. Complete Home Improvement aspires to deliver a specialised and modern approach to creating an outdoor setting that is beautiful to glance at and convenient to reside in. If you want your outdoor living space to harmonise your property, you require expert garden landscapers to alter your home. 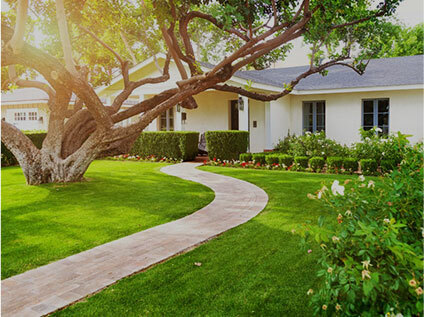 When it comes to landscaping services in Sydney, Complete Home Improvement offers a personalised approach and sticks to your original idea while designing and creating a garden that emits your personal feel and style as well as remains within your budget. Our fully qualified team of Sydney landscapers is ready to tackle any landscaping project. Whether it’s a big or small landscape design project, we are here to help you achieve the outdoor environment of your dreams. Our workmanship is guaranteed in every phase of your landscaping project with accurate accountability. Our landscapers in Sydney enjoy working with clients and are committed to building a beautiful outdoor area for them. We strive to create an outdoor space that is attractive and awe-inspiring to your lifestyle. Whatever project we take up, our ultimate goal is always to transform your dream into a reality by designing a wonderful landscape for you. Besides landscaping, we also recommend practical home improvement features such as decks, patios, awnings, outdoor blinds and more. Complete Home Improvement delivers distinctive, beautiful and practical gardens across a wide range of Australian homes. We design a residential landscape without disturbing the existing garden features such as fencing, paths etc. Whatever the scope of your landscaping project is, we can give shape to your thoughts by creating a spectacular outdoor area. Contact landscape contractor Sydney – Complete Home Improvement on 1300 912 293 and take the first step towards creating your new home-garden landscape.